Non-THC hemp, also known as hemp grown for fiber or industrial hemp, is a pretty boring plant from the Rosales order whose fiber can be spun into sturdy ropes or other textiles. 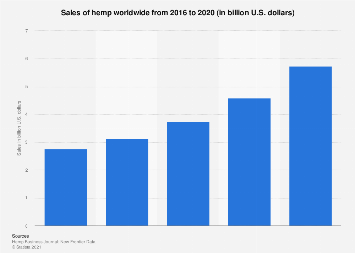 Yet, because its close cousin of the Cannabis sativa variety is being cultivated for its high THC content, industrial hemp has been outlawed in several countries in broad measures to eradicate pot smoking – including in the U.S. The 2018 Farm Bill signed into law by U.S. president Trump in December has now lifted that federal ban and the hemp industry is expected to flourish as a result. 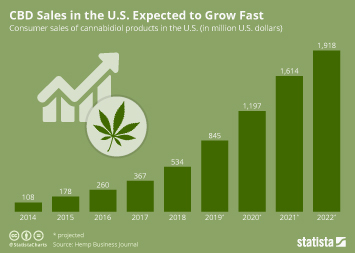 Market growth is predicted not only because of the fast-growing good quality fiber the plant produces, but also because of the popularity of CBD products that can be derived from it. The substance also known as cannabidiol is viewed to have medical benefits like relieving pain and anxiety without the intoxicating effects of THC. Hemp growing had already been legal in some U.S. states. 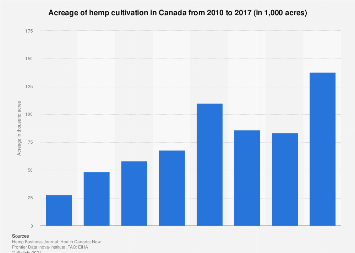 Colorado and Oregon, both trailblazers on the weed front, are cultivating the most acres to date, according to a report by publication Hemp Industry Daily. Legalization mostly went together with the legalization of THC variety cannabis for medical and later for recreational purposes. Some states, like Kentucky, North Carolina and Tennessee, have legalized hemp growing especially for the purpose of producing CBD for medical marijuana programs in their states. This chart shows acres of industrial hemp cultivated in the biggest-producing U.S. states and legalization dates for medical and recreational marijuana in those states.